While pregnancy brings about that glow on your face and makes you feel special, it also brings with it, its share of discomfort and an assortment of problems. Although the rainy season makes you feel blissful, it does nothing to assuage the discomfort a mom-to-be. 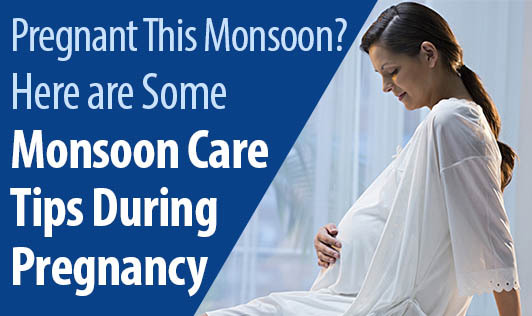 Here are some suggestions that can help you enjoy the bliss of monsoon while you’re pregnant and make you feel better during the season. Right Choice of Clothes: Being pregnant during summers can be a frightful experience, especially with all the excessive sweating. Regrettably, the monsoon is likely to make you sweat more since the level of humidity increases tremendously during this season. Choose clothes that are lightweight and keep you comfortable and cool- preferably cotton. Synthetic fabrics are a big NO since they retain heat and perspiration and may cause rashes and prickly heat. Avoid wearing uncomfortable, body-hugging clothes, especially when you have a big tummy. You should also be careful about the shoes you wear. Buy some supportive shoes if the roads are slippery or waterlogged. Avoid rubber-soled shoes or slippers as they can cause you to slip on wet surfaces. If you are a working woman, it is advisable to carry an extra set of clothes as it can be of great help if you get drenched. Healthy Food: Monsoon is the time when you need to be very cautious about your diet and food intake. Staying hydrated is essential, even during the rains. Drink plenty of water (strictly filtered), coconut water, homemade lemonade or juices. Avoid food served by roadside vendors, like raw or chopped vegetables and cut fruits, juices, snacks, and water, or milk-based drinks. They have a tendency to absorb moisture too fast making them ideal agents for bacterial growth. Food-borne and waterborne diseases increase during the monsoons. So, if you eat out, choose a place that is known for its cleanliness and hygiene. Boost your immunity levels by eating more home-cooked food. Use filtered water to cook, knead the dough or wash the meat you want to cook. Raw eggs and seafood should essentially be avoided during monsoons. Be extremely careful with foods like prawns and fish as monsoon is the breeding season. Raw fish and sushi are a big NO. Try eating a balanced diet and incorporate a lot of protein sources to meet your body’s nutritional requirements during the rainy season. Make it a ritual to clean green leafy vegetables several times in filtered, boiled water and steam them to get rid of any germs and bacteria. Be careful with green leafy vegetables like cabbage, spinach, and cauliflower because of the presence of dirt, mud, and worms. If you wish to consume them, make sure you blanch them thoroughly and wash them in salt water. Hygiene: Keeping yourself fresh and clean during the monsoons is a must. You should bathe at least twice in a day. A neem water bath during this season will greatly help pregnant women deal with the stickiness in the air and will leave your skin smooth and free of rashes. All you have to do is boil a handful of neem leaves for 15 to 20 minutes and then add them to your bath water. After the bath, dry yourself well. Keep your clothes, footwear, socks, and raincoat clean and make sure that they are dried immediately and are free of all moisture else they will become a breeding ground for germs and molds. Make sure you keep wet tissues or towels dipped in cool water handy so you can use it whenever you want to wipe sweat and grime away. Wash your hands and feet regularly with lukewarm water and a disinfectant soap to keep them clean and shielded against infections. Keep your nails clean by preferably cutting and trimming them regularly. Use mosquito repellants since mosquito population rises in stagnant water. Clean Home: Monsoon is often marked by the outbreak of many diseases, which either are waterborne or spread through mosquitoes. Therefore to have a complication-free pregnancy, ensure that you keep your home clean and fresh. Using a disinfectant to clean the floors and washrooms is a must. To protect your home from flies, mosquitoes, cockroaches, termites, and other diseases, use effective pest control measures. Grandma’s Trick: Keep a small mesh bag of cloves near your window or in your cupboard to let fresh natural scents fill up the air around you. Burning camphor, incense sticks, therapeutic oils, or neem leaves will also help purify the air and enliven your spirits. Hepatitis A virus, which causes jaundice, is transmitted through water and food. Jaundice during pregnancy can be very dangerous and life-threatening. Typhoid is also transmitted through water and food. Typhoid can create complications during pregnancy, so be very careful. Acute Gastroenteritis (diarrhea and vomiting) caused by bacteria and viruses in water and food can have serious effects on pregnancy. It may even warrant hospitalization because of dehydration. Be extra careful when walking on the road, because if you slip and fall, the trauma can lead to premature delivery and other problems in pregnancy. Be aware of live wires and open manholes when walking on the road because water can trigger short circuits and can be very dangerous.